And when he shakes his mane, we shall have spring again. —C. S. Lewis, The Chronicles of Narnia: The Lion, the Witch and the Wardrobe. Is God going to destroy Earth and make a different one from scratch? Some Bible teachers think that the Earth will be completely destroyed and a different earth will be made from scratch. But the Bible teaches us that while the Earth will be destroyed for a while, it will be restored. God will make the same old earth into the “New Earth,” which will be better than it ever was! Think about the Flood that happened during the time of Noah. Although the earth seemed “destroyed,” it really wasn’t. It continued to exist. We know the Bible says our bodies will die, but God will bring the same bodies back to life in a much better condition. In the same way, the Earth will die, but God will bring it back in a much better condition. That will be the New Earth. You could compare the Earth’s future changes to that of a caterpillar. As you know, major changes happen to a caterpillar after it goes into a chrysalis. It comes out a new creature—a butterfly. It hasn’t stopped existing. It’s the same, yet transformed. And it’s a real, lasting transformation. Though transformer action figures can be changed back and forth, the butterfly can’t be changed back to a caterpillar (nor would it want to be). Likewise, the New Earth will never change back to the old Earth. When God fashions this earth so that it’s new again, we’re going to live with him on it. Remember, Jesus is a carpenter. What do carpenters do? They make things, and they fix things that are broken. This earth is broken. It’s far from perfect now, because of sin. But Jesus is going to fix it, just like he’s going to fix us. We will be the same people made new, and we will live on the same earth made new. Will the New Earth be like our Earth was in the beginning? What’s the most beautiful place you’ve ever seen or hope to see? What made it beautiful to you? The Garden of Eden was probably the most beautiful place that ever existed. After all, the first people God created lived there in the days before pollution or earthquakes or wars or poverty or crime. We can only imagine what it was like. Every beautiful place on earth—the Grand Canyon, the Alps, the Amazon rain forests, the Serengeti Plain in Tanzania (where lions roam)—is just a small taste of what New Earth will be like. It’s like when your mom or dad lets you have a tiny piece of turkey or dressing to sample just before the Thanksgiving meal. It’s not enough to satisfy you. But it’s good enough to help you think about how delicious the whole meal will be! All our lives, even if we don’t know it, we’ve been dreaming of the New Earth—the Heaven that will last forever. Whenever we see beauty in water, wind, flower, animal, man, woman, or child, we see just a sample of what Heaven will be like. We should expect this New Earth to be like the Garden of Eden, only better. That’s exactly what the Bible promises: “The LORD will comfort Israel again. Her desert will blossom like Eden, her barren wilderness like the garden of the LORD. Joy and gladness will be found there. Songs of thanksgiving will fill the air” (Isaiah 51:3, NLT). Will places like the Grand Canyon actually be on the New Earth? Ever see an old house, car, or painting fixed up to look the way it used to be (before age and wear and tear messed it up)? Some of the paintings by famous artists from centuries ago have been restored. What’s that all about? Well, an artist or a team of artists cleans and (if necessary) uses new paint to brighten the faded colors of a painting. Although the painting is still the same, it looks once again like it was meant to look. The New Earth will still be Earth just as we, in our new bodies, will still be ourselves. So we can expect New Earth’s sky to be blue and its grass green. Lake Louise (in Alberta, Canada) will likely become New Lake Louise. Then Peter, Edmund, and Lucy gasp and shout and wave because across a valley they see their father and mother! We will meet all kinds of new people and see all kinds of new places—but we will also see familiar people and familiar places, because we will be with resurrected people we love on the resurrected Earth we love. Based on what the Bible says, I think we’ll not only see things the way they are now, but we’ll see things the way they were meant to be. On the New Earth, no good thing will be destroyed. Everything we love about the old Earth will be ours on the New Earth-either in the same form or another. Once we understand this, we won’t regret leaving all the cool places we’ve seen or wish we’d seen. Why? Because we know we’ll see many of them on the New Earth—and they will be better than ever! 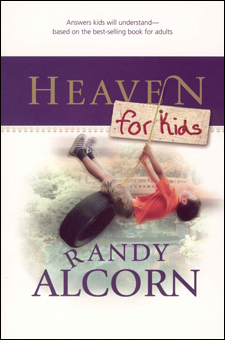 Excerpted from Randy Alcorn’s book Heaven for Kids.